Why not the center city? 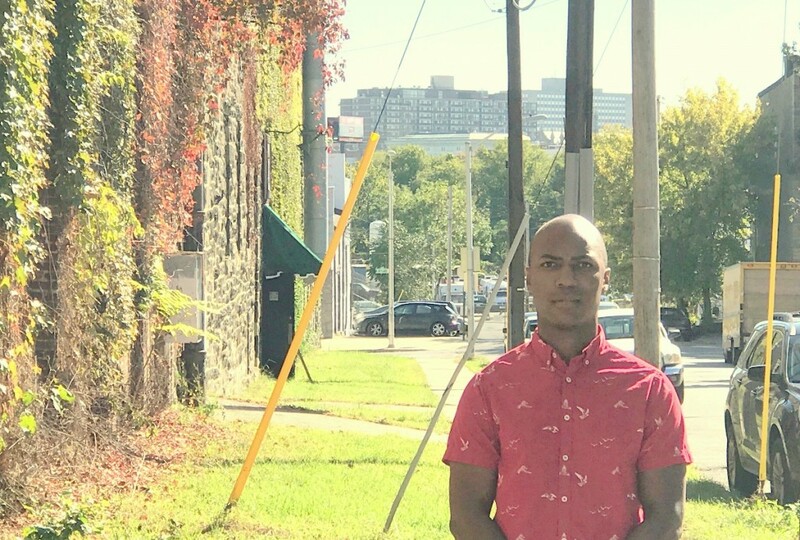 Frustrated by the Pugh administration’s exclusive focus on Port Covington, a community group has called on Amazon to consider north-central Baltimore as a candidate for its planned second headquarters (HQ2) hub. “Center City offers Amazon the most diverse range of building typologies and zoning options, allowing Amazon to build a 21st century campus within a compact, walkable and beautiful 19th century urban fabric,” the Old Goucher Community Association noted in a bid the group submitted yesterday to the Seattle-based online retailer. The proposal has already triggered a rebuke by Mayor Catherine Pugh. Kelly Cross, president of the Old Goucher group, said the mayor called the proposal “a joke” in a telephone message and said it had “no standing or support” from her administration. Council President Bernard C. “Jack” Young was also critical, arguing in a phone call to Cross today that Old Goucher and other community groups had to present a united front in support of Port Covington. “This is not about our competing with Port Covington, but highlighting how center Baltimore better conforms to the requirements issued by Amazon,” said Cross, who prepared the bid with the help of association vice president Jay Orr and other volunteers. The proposal identifies 200 acres of land and 15 million square feet of real estate within a 1½-mile radius of North Avenue and Charles Street, ranging from State Center in Bolton Hill to the failed 25th Street Station project in Remington. For example, Cross pointed out during a tour of the area yesterday with a reporter, City Schools is evaluating whether to vacate its North Avenue administrative headquarters, a handsome 215,000-square-foot property two blocks east of Charles Street. On the west side of North Avenue, a longtime eyesore, the Madison North apartments, has been razed, opening up a strategic site opposite student housing owned by the Maryland Institute College of Art. 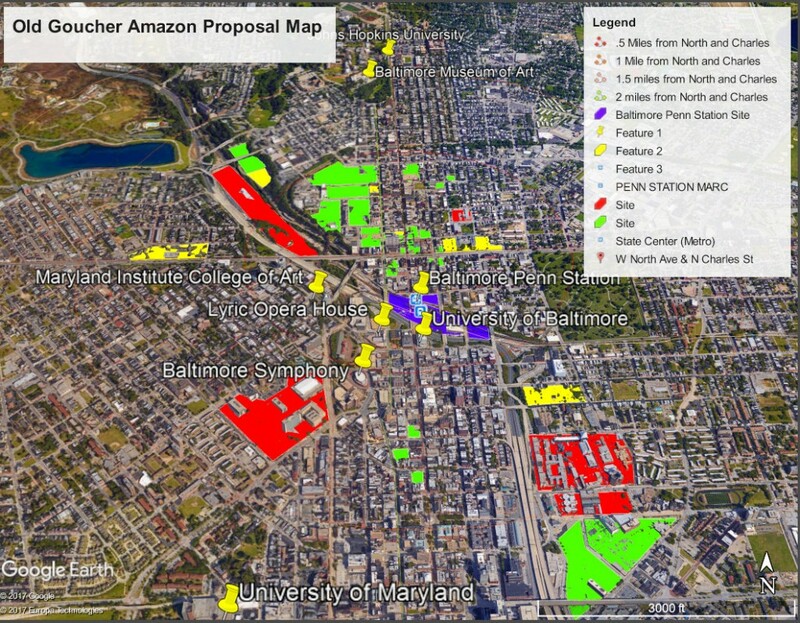 Overall, center Baltimore better meets Amazon’s requirements than Port Covington, the three-page summary proposal argued, based on the retailer’s needs for a campus that has direct access to rail transportation, is within 45 minutes of an international airport, and includes top-notch educational institutions and cultural attractions. “It’s a 13-minute train ride to BWI Thurgood Marshall Airport from Penn Station,” Cross pointed out, while Acela service whisks passengers to Capitol Hill in Washington in 35 minutes and Madison Square Garden in New York in under 2½ hours. “Look at what else we have around North Avenue and Charles,” Cross enthuses, standing on a vacant lot of what was once a premier address. Cross then ticked off the district’s cultural institutions (the newly-opened Parkway Theatre, the Lyric Opera House, the Joseph Meyerhoff Symphony Hall, the Baltimore Museum of Art). There are recreational opportunities for Amazon newcomers at Druid Hill Park and –”if given some attention” – the Jones Falls Valley. Plus hundreds of historic and unique townhouses available for the fraction of the price of real estate in other cities competing for the HQ2 prize. “So why are we putting all of our eggs in the basket of Port Covington?” Cross asked. Realizing that the Baltimore Development Corporation (BDC) and other “economic powers-that-be” were not about to consider any site other than Kevin Plank’s Port Covington property, the Old Goucher group decided to submit its own proposal. “We talked to people in Philadelphia, Pittsburgh and other places who told us that their cities were submitting multiple sites to Amazon. But that wasn’t happening here. City Hall decided it liked what it’s already given so much money to,” Cross said, referring to the $660 million in TIF tax incentives pledged to Port Covington. While acknowledging that his group’s bid is, at best, a long shot, he also believes that the Pugh administration “missed the boat” in understanding Amazon’s needs and corporate culture. The financial incentives that the Pugh administration has offered to Amazon remain private. Gov. Larry Hogan also has not revealed how the state will sweeten the deal except to disclose, through a spokesman, that Amazon will receive the “biggest incentive offer in the state’s history” if it decides to locate in Maryland. During a pep rally on Wednesday, Mayor Catherine Pugh ceremonially signed a cover letter pitching the Port Covington site, surrounded by officials from Sagamore Development, the real estate arm of Plank, the CEO of Under Armour. Way to Reboot West Baltimore? 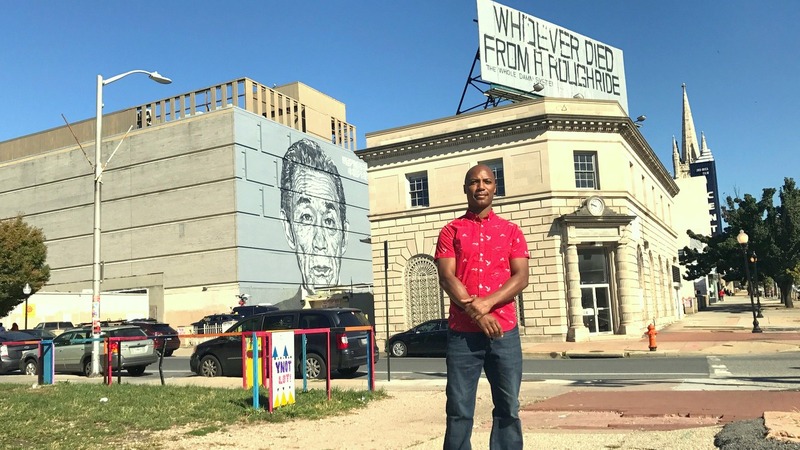 The Old Goucher proposal encompasses parts of Penn North, Mondawmin, Sandtown-Winchester and Upton where rioting broke out after the 2015 police-in-custody death of Freddie Gray. “50,000 new jobs coming to center Baltimore as part of an Amazon relocation would have massive ripple effects in these neighborhoods,” Cross said. In its proposals to Amazon, the group noted that Old Goucher and the other nearby neighborhoods are “by far the most racially and ethnically diverse part of Baltimore” and have a large number of residents with a bachelor’s degree or higher. The mayor’s office was asked yesterday and again this morning about Old Goucher’s proposal, and how it might fit into the administration’s plans to devote more resources to neglected neighborhoods.